SWMGAMERS.com Forums • View topic - Hey Chancellor, Need a Lift? Hey Chancellor, Need a Lift? Post subject: Hey Chancellor, Need a Lift? Overview: The Separatists are attacking Coruscant in an attempt to capture the Supreme Chancellor to end the Clone Wars. (Takes place at the end of Clone Wars cartoon, season 2.) The Chancellor must get to the Jedi Temple where he can confer with the Jedi Masters and be safe from the Separatist attack. Goals: The Republic goal is to get the Supreme Chancellor to the Council Chamber in the Jedi Temple using the turbolifts on the maps. The Separatist goal is to defeat Supreme Chancellor Palpatine. Train Map-Supreme Chancellor Palpatine (SCP) will start in the Passenger car of the train nearest the turbolifts. The Separatist Forces will start in the other train. Mas Amedda will start within 2 squares of SCP. Ossus-Republic Forces may start anywhere on the Meditation Shrine/Cargo Lift/Force Training Room area. Separatist Forces may start anywhere on the Landing Platform, but must start to the left of the first staircase. Jedi Temple-The Turbolift Tile will be placed on the edge of the map, over the area that says "Library". Republic forces may start in any of the named Rooms, including Archives, Security Post, and Council Chamber. They may not start in the Library or the Grand Hall or in any of the hallways. The Separatist forces may start anywhere on or within the dark gray rectangle of the Landing Pad, not including the stairs. players will either play previously constructed squads or they will build their own squads. Turbolifts-ANY piece may move from one map to another. The players will stay on their respective maps during the duration of the scenario. In order for a piece to use a turbolift, they must end the round inside that turbolift. They will then start on the map with the corresponding letter of that lift when those two players roll for a new initiative. The lifted pieces will start inside the lift of the new map with the door open. If a piece from each side is in a turbolift, the lift stays where it is until there is only characters from one side in the lift. All Commander effects will only be valid on the map with the Commander. Commanders may move in the lifts. Alternates-If only 8 people play, eliminate the Ossus map, and change the Nightclub turbolift from C to D. If 11 people play, have a person play as Black Sun on the Train map. That person will roll for a "Alliance check." Even for Republic, Odd for Seps. That person will set up between the trains. Prince Xizor will be the only Black Sun Unique. Well, that is the idea. Your thoughts and suggestions? Post subject: Re: Hey Chancellor, Need a Lift? So, if I undersatnd this correctly, it means that you can use Turbolifts to transfer figs from one map to another. So, if player A loses their BDO, player B can transfer theirs to that person with the turbolifts, correct? BUT, once those figs are transferred, they are played by the individual in charge of that map? Correct? And I know this would be a pain, but it would help in analyzing the scenario. Would it be possible to see all five maps connected, maybe in stages over a few photograps with the "route" each side would heve to take to get to the final goal map? Absolutely correct on both accounts. Sorry it's so small. The Turbolift Tile goes over the chairs on top of the map, with the "Hallway" end of the tile on the bottom. The left side lifts are E, and the right side are D. Seps start on the left of this photo, and the Reps start in the rooms. The Turbolift on the bottom is C, and the top is D.
Thanks Fool. 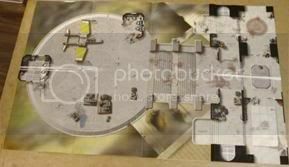 Can anyone find a pic of the new starter set map? Last edited by hothie on Mon Nov 10, 2008 6:19 pm, edited 6 times in total. What prevents the members of each team from just immediately sending all of their pieces to the "end" map and it turning into a 1500 point scenario all on a single map? Were that to happen I don't see how the Republic could lose the scenario. Because at most you could only send 4 per round per lift. We're talking 300 point armies here with lots of activations. 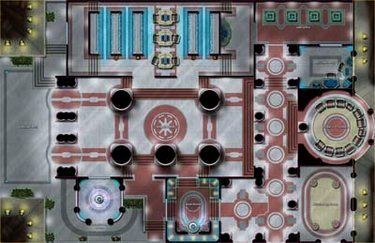 Plus, if those pieces are all on the temple map, then only the temple players would be playing. I mean, you could do something like that, but each of the players will be playing on their maps as well. Also, SCP has to get onto at least 3 maps to get there,and when he does get to the 2nd map, if all of those Reps are gone, he could be screwed before he gets to the temple. And when he does get there, if there are seps at the lifts, too, he could be defeated. The way I have it figured is this: SCP will probably take at least 2 rounds to get to the turbolifts on the train station. During that time, the players on the other maps will be fighting for control of the lifts. SCP could take lift A on the train station, but that would put him right in the middle of the fighting on Bespin, or right near where the Seps start on Nightclub. Or, he could take lift B at the Train station, which would put him at the back of the Nightclub, which is more protected. He would then have to go to Ossus and cross that map before getting to the Temple. Essentially, the quick route is more dangerous, but the safer route will take longer, which might allow the Seps on the jedi Temple more time to control the lifts there. I might put San in the Jedi Temple, for possibility of more reserves. SCP's Reserves will start adjacent to him if possible, on whatever map he's on at the time. One question: What are your thoughts on handling comms or the fog of war here? Do the players on every level know what's going on on all the other levels? If I didn't know what lift SCP was going to pop out of on my level, it'd be a different strategy than if I was watching him head to a particular lift on a lower map. Yeah, players can kinda see what is going on with the other maps before deciding which lift to take. (After all, there are comlinks on Coruscant, right? ) And players can coordinate as well..."Hey, have a Jedi near the lift to be a bodyguard for SCP when I move him over there" Because, ya know, ya gotta have protection for SCP traveling from one location to another, especially with a Separatist invasion going on. And the Seps can coordinate, too. "Roger Roger"